shaun-_-, 21 Nov 2014Why Apple do such stupid things like sell a product with 16GB of memory and you can't upgrade ... moreThe future goes through cloud storage and cloud computing, so in a few years from now, sd cards will be obsolete and useless. You can still buy higher capacity mini 3 anyways, on a tablet 64 GB should be more than decent. Did anyone notice the display color? Thanks for the review,will buy the Sony Z3 Tablet Compact instead. Anonymous, 23 Nov 2014iPad mini 3 is not bad. Its in fact very good. But its no excuse for Apple NOT to use A8 / ... moreMini 2 ate all the sales of air, they want you to buy the full sized ipad. If mini 3 was like air 2, no one would buy air 2. Anonymous, 24 Nov 2014Its no illusion that this is for profit. And is in no way an "Apple" approach. By... moreIpad air 2 is too thin to have mute button, mini 2 ate all the sales of ipad air, THINK! Even iB0ys will agree this is the worst iPad upgrade. Mike, 24 Nov 2014I have the iPad mini 2. What was Apple thinking as already people have stated that this is the... moreSamsung did it also. Same chipset multiple devices.. just little differences. Thats what generate so much anger in this product. This year's hardware is especially hurting for all Apple fanboys, no thanks to Intel delay. 1. U2 in Apple iPhone event... Seriously?? 2. Non upgradable Mac mini ... refresh in 723 DAYS.. omg. drop from core i5 2.5Ghz down to dual core 1.4Ghz??? which you need to fork out 200$ ++ for the better version. 3. Tim Cook shaking watch infront of you ...taunting you which you will get no sooner then 100 DAYS LATER. I have the iPad mini 2. What was Apple thinking as already people have stated that this is the worst upgrade ever by any company known. How have they got away with this, Touch ID apart from that everything I mean EVERYTHING is identical to a tee. Even for new customer thinking of getting an iPad please take note go for the one I have ipad Mini 2, I am more than impressed with it. Battery life is amazing, display, touch sensitivity. Only problems I'm having is with these software updates they still haven't got them right yet but that's just nit picking TBH. AnonD-209094, 24 Nov 2014Apple has read your post and is immediately launching a Mini 3S with 8GB RAM and octacore CPU,... moreIts no illusion that this is for profit. And is in no way an "Apple" approach. By right, you look at all Apple products, they provide the very best experience, compromising ANYTHING that would destroy THAT experience. Everything is build with a thoughtful mind. Nothing is wasted. All in hopes that would in turn bring about profit. But this time round.. they did the worse thing possible.. they place profit first. iPhone 6 Plus can have A8, but iPad mini 3 they skip it. iPad Air 2 they remove mute button.. but iPhones they manage to keep it. All this inconsistency and bad management is showing. Anonymous, 23 Nov 2014iPad mini 3 is not bad. Its in fact very good. But its no excuse for Apple NOT to use A8 / ... moreApple has read your post and is immediately launching a Mini 3S with 8GB RAM and octacore CPU, NFC, IR blaster and... This is the point where you wake up in the hospital to find yourself restrained by thick leather straps. In other words, DUUUHHHHHHH... Illusions of grandeur. X, 23 Nov 2014The iPad mini had the previous version chipset normally, except for the iPad Mini 2. The scree... moreOMG! Your math teacher called and want to refund your tuition fees, all of it, just make sure the schools name will never ever be associated with your name and they may add a few thousand bucks just to cover up the failed student. 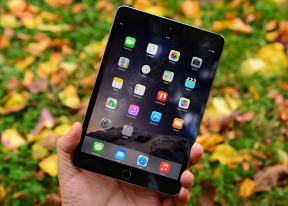 iPad Mini 2 32GB is $150 cheaper than iPad Mini 3 64GB, ONE HUNDRED AND FIFTY! Ipad Mini 2 32GB is also $50 cheaper than 16GB Mini 3. So is it worth it to save $150? yes, but dont underestimate the convenience of the TouchID, not only does it replace your 4 digit PIN but also your 8 character long password in iTunes/App store and very different from Samsung fingerprint solutions TouchID actually WORKS, a word that probably does not exist in any Korean dictionary, where "done" is impossible to determine if it means half-baked or half-raw. Anonymous, 23 Nov 2014iPad mini 3 is not bad. Its in fact very good. But its no excuse for Apple NOT to use A8 / ... moreThe iPad mini had the previous version chipset normally, except for the iPad Mini 2. The screen doesn't really need to be improved as the resolution is the same as on the Air, on a smaller screen. Apple doesn't run the specs race unless it needs to increase performance over the competition. As I said, it doesn't make much sense to buy the 16GB iPad Mini version. In fact, it doesn't make sanse to buy any iOS device with that memory space anymore. Only from 32GB up. So in that case, iPad mini 2 at 32GB is only 50$ less expensive than the 64GB iPad Mini 3, practically the same device, plus the TouchID. Is the 50$ worth on long run? I would say yes. X, 22 Nov 2014If the iPad mini is so bad why is everyone, including Google, trying so hard to copy it? If y... moreiPad mini 3 is not bad. Its in fact very good. But its no excuse for Apple NOT to use A8 / A8x in the product. There is not even wifi ac!! Its practically the same chipset. They did not even BOTHER to improve the screens.. its the same old version from 2013. This is the FIRST time in Apple history, they did something like this in their products. Its very alarming indeed. If Apple is reading this, they better change FAST. What i see in 99% of the post, iPad mini 3 is just a iPad mini 2.. No effort = No buy = no profit..
"Of course, the €100 cheaper Apple iPad mini 2 is the one lots of people will choose over the iPad mini 3 because the price premium for the new Touch ID sensor is hardly worth it. " This is valid only for the 16G versions. However, for the next level, the iPad Mini 3 has 64 GB instead of 32 and is only 50 bucks more expensive. Since nowadays 16 GB is not sufficient the only options are those with more memory space. Shaun-_-, 21 Nov 2014Apple, your products logging way behind in the hardware department in comparison with the flag... moreThe 192 core nvidia gpu got beat by the gpu on the Air 2. So in terms of hardware power, apple is not behind. They are even currently in the lead! Too bad Apple gimped it without the iPad Air 2's 2GB DRAM and A8X tri-core. Guess we'll wait until Mini 4.